In a city where substance triumphs over style, it could be said that Stan Barron led the charge in giving voice and recognition to the average Buffalo Sports fan, and, in so doing, he pioneered a popular modern-day radio format. Spanning a broadcast career of 38 years, Stan is widely regarded as the founding father of sports talk radio with his “Free Form Sports” program, heard on WBEN Radio five nights a week beginning in the late 1960s. His show was a blue-plate special of sports and scores, blending music with commentary and served up with Stan’s unique gravel-voiced tone. He was everybody’s best friend when it came to talking about sports – that’s how fondly Western New Yorkers remember him. No local sports score was too unimportant to make his show, and his grassroots appeal attracted listeners and callers who enjoyed his brand of hometown, lunch bucket sports talk. A native of New York City, Barron came to Buffalo in 1952 and began nine years at WKBW radio and television. Serving as Channel 7’s first sports director in 1958. 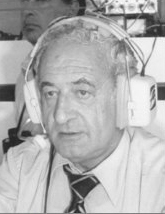 Stan paid attention to every sport at every level of competition with such passion that his versatility and creditability made him a highly sought-after announcer. His play-by-play career in Buffalo included 14 years as half of the “Stan and Van” broadcasting team of the Buffalo Bills, four years announcing for the hockey Bisons of the American Hockey League, six years of Canisius and Niagara college basketball, several years of University at Buffalo football and four years of Bisons baseball. By far, baseball was his favorite sport and some of Stan’s most substantial contributions to the community were the result of that love. Barron wrote and spoke in vigorous support of the community ownership initiative that saved Buffalo’s International League franchise prior to the 1956 season. He was equally vocal in backing baseball’s return to Buffalo in 1979. Since his death in 1984, the Bisons have honored him by awarding the “Stan Barron Most Valuable Player Award” to the player who exemplifies outstanding ability, good sportsmanship and dedication to the game. And in the summer of 2001, baseball paid further tribute to his memory as Stan became the 69th member of the Buffalo Baseball Hall of Fame. Distinguished by his sincerity, his ability to communicate, his enthusiasm for sports and for those who played the games, Stan Barron left a lasting impact on his profession and on his adopted community.